Riders and Drivers who raced at the Double Diamond track were awarded life time free membership to the club. 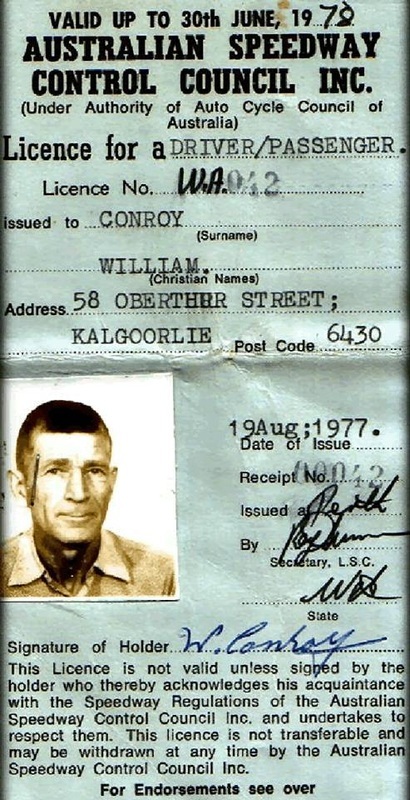 Bill was a local who raced a motorcycle with success at the Double Diamond Speedway, he moved to Rockingham and lived there for a time until he fell ill, at this point he returned to Kalgoorlie to see out his final days, cared for by his family until he passed away. Bills family still has a Diamond Speedway Trophy in there collection. With a very valuable asset to the solo ranks last meeting, he looks pretty safe and and was consistantly there to hold up the weakining solo fields, Peter is the brother of Mick who had a few rides last season and son of Kalgoorlie gold prospector Bill, solo racing has been a way of life for the Conroy family and even the old man had been riding until recently, unfortunately tonight will be Peters last ride at Claremont for a while because he's only been in Perth for a holiday and is heading back to Kal. Prospector, aviator extraordinaire, worlds oldest solo rider, passionate lover, collector of female navel lint, casual hero, old jungle fighter, forward scout, inspector of female daks, and Ghostie's best mate, built a magic solo track in Kalgoorlie. Allan Baker has done a walkabout and as you can see it wont be long and this track will like many others, lost for ever. In 2010 the race track was still intact as well as the tyre wall, the land was currently being used by Paul Stokes to run horses.